These are 'movie-magic' weapons and the "style of the sword" weapon is that of a polearm. Polearms were common weapons on medieval European battlefields. Their range and impact force made them effective weapons against armored warriors on horseback, because they could penetrate armor. A guisarme (sometimes gisarme, giserne or bisarme) was a pole weapon used in Europe primarily between 1000–1400. It was used primarily to dismount knights and horsemen. Like most polearms it was developed by peasants by combining hand tools with long poles, in this case by putting a pruning hook onto a spear shaft. While hooks are fine for dismounting horsemen from mounts, they lack the stopping power of a spear especially when dealing with static opponents. While early designs were simply a hook on the end of a long pole, later designs implemented a small reverse spike on the back of the blade. Eventually weapon makers incorporated the usefulness of the hook in a variety of different polearms and guisarme became a catch-all for any weapon that included a hook on the blade. Ewart Oakeshott has proposed an alternative description of the weapon as a crescent shaped socketed axe. The kama can be used singly or in pairs. 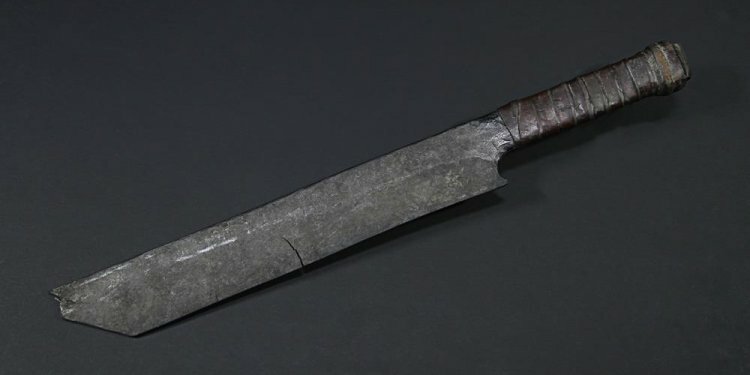 Both the point and sharpened edge of the metal blade are called into use, Okinawan kata suggesting that it could also be used to block, trap and disarm an opponent's weapon. Notice how none of these is a sword, because swords don't have hooks on the end of them. A sword is a bladed weapon intended for both cutting and thrusting. The precise definition of the term varies with the historical epoch or the geographical region under consideration. A sword in the most narrow sense consists of a straight blade with two edges and a hilt, but depending on context, the term is also often used to refer to bladed weapons with a single edge (also referred to as a backsword).